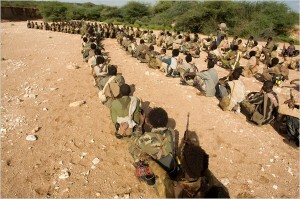 Why does EPRDF negotiate with ONLF? man massacred 80 commanders of West Somali Liberation Front (WSLF). Zaid had taken the move to set up ONLF to expand its hegemony in Horn of Africa; however, it has not only dashed Somali nationalism, but fomented lasting mistrust among Somalis in the republic of Somalia. This has been one of the reasons that Somalia would not have had a government in the last twenty years. The eleven higher executive members of ONLF were not born in Ethiopia, but in Somalia. The chairman of ONLF, Admiral Mohamed Osman was the head of Marine in Somalia under the leadership of dictator regime of Zaid Barre. He does not have a clue about Ethiopian politics. On the contrary, the only one who was a native of Ethiopian Origin, Dr. Dolal was killed two years ago when he questioned genuinely ONLF to be the sole representative of all Somalis in Somali Region. Dr. Dolal argued that we, Ogadeni, are one clan and we had seen what the clan politics had inherited to the Somalis nation; why do we ignore the majority of Somali people in Somali Region and pressed to reform ONLF to be morphed to WSLF. Ironically, he was captured in Somali Region while he was negotiating with WSLF. It was secretly the leaked information of ONLF to the current president of Somali Region that masterminded his killing which was against international law, to execute a captured leader of rebel without due process. In 1977, WSLF had refused the regime of Mogadishu to intervene in their business where the front had liberated ninety percent of its lands from the soldiers of Mengestu Haile Mariam who were killing left and right the innocent Somalis in Somali Region. The current Ambassador of Ethiopia in Egypt, Mohamud Dirrer, was the highest member of WSLF at the time. In the summer of June 1977, the tanks and airplanes of the regime of Zaid Barre had violated the territorial integrity of Ethiopia so that he could extrapolate its internal crisis and beating the drum of nationalism to elongate its power. democratic republic of Ethiopia whereby all Ethiopian regardless of its origin will be treated on an equal footing without the secessionist and settlers ideologies that were hovering on the country. social in 1991 that culminated with the classical constitution of 1994 that introduced such as article 39 that allows any nation to organize along the line of its culture, linguistics, historic and other social factors and would go its own way in case it decides its future. The simple answer is that EPRDF wants to stay in power without implementing the constitution genuinely and put the third largest population, Somalis in Ethiopia in “Aggar” category that is surrogated misnomer to undermine Somalis, Gambelas, Afar and Benshugal. To put in historical and ideological perspective, EPRDF/TPLF should know that the clan makes up of Somali politic. In other word, one has to comprehend that Somali identity is traditionally rooted in paternal descent meticulously memorialized in genealogies that determine each individual’s exact place in society. At the apices of this structure are the “clan-families” with their quasi-mythic lineages harkening back to the family of the Prophet Muhammad. In modern times, the advent of instantaneous mass communications has, ironically, rendered these traditional divisions an even more significant factor in Somali national politics, as it has enabled both geographically separated members of the same groups, including those in the far-flung diaspora, to interact with each other and organize themselves to pursue common political objectives. This is a result of the underlying power structures within Somali society. EPRDF should address the issues of Somali Region while she would ground in its historical, political, economic and social context if it wants a lasting peace, prosperity and sustainable development that have been booming in other regions of Ethiopia.